Update: This is the first part in the series. Here are links to all the parts of Narandra Nayak’s rationalism tour of India: Intro, Part 2, Part 3, Part 4, Part 5, Part 6. Narendra Nayak, the president of the Federation of Indian Rationalist Associations, is travelling India to train rationalists on how to investigate paranormal claims. His schedule can be found here. In this page, we will follow Narendra with weekly updates as he makes his way through the country. The latest reports will appear at the top of this article and you can scroll down for his previous stops. Check back here to see what he is up to now! I am in Hyderabad after Ghaziabad. Yesterday we had interactions with students of two schools in Hyderabad. 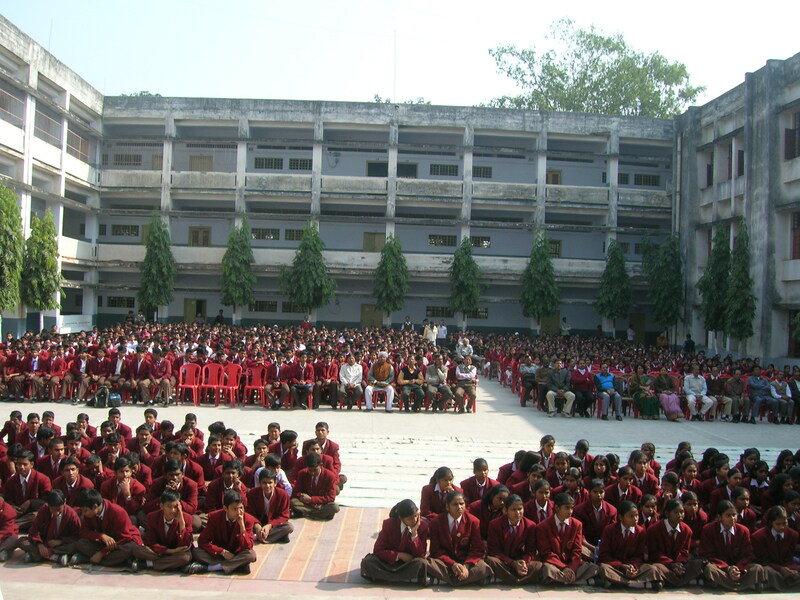 Vidya Niketan School at Pragathi Nagar and a Tagore school. Today there is a day-long teacher’s training program at District Institute of education and training. On January the 2nd there is a one day program at the Vishweshwarayya Museum in Bangalore. Sri Sunil Kumar is in charge: Phone – 22864563, 22864114 ,2286 4009. Those in Bangalore who are interested can contact him for details. It is likely to be a one day affair, starting at 11 and ending at around 5 or so. In the meanwhile we are getting alot of requests for training programs in North India. There will be four programs, possibly, in Uttar Pradesh, four more in Bihar and one each in Uttaranchal and Jharkhand. I am also involved in a program of educating teachers about prevention of lead poisoning in children with QCI and we are likely to hold training programs in UP and Bihar in the first week of February. At the end of these tours I could take a break and conduct our rationalist activity. So, the schedule looks pretty hectic for the next few months..Tomorrow (21st) will be the Ramamurthy memorial oration on Rationalism Humanism and scientific temper at Hyderabad. Narendra is now on his way to Delhi. Starting on the 12th, there is a training program at Ghaziabad. The tour thus far includes the following places, along with the number of trainees at each place. 20-24 Nov. Tatanagar trainees -17 nos. 25-29 Nov. Bokaro- 25 nos. 30-4 Dec. Dumka 25 nos. Pictures and write-ups from Dumka and Lohardhaga will follow, stay tuned. Narendra Nayak is now in Bokara after leaving Tatanagar. 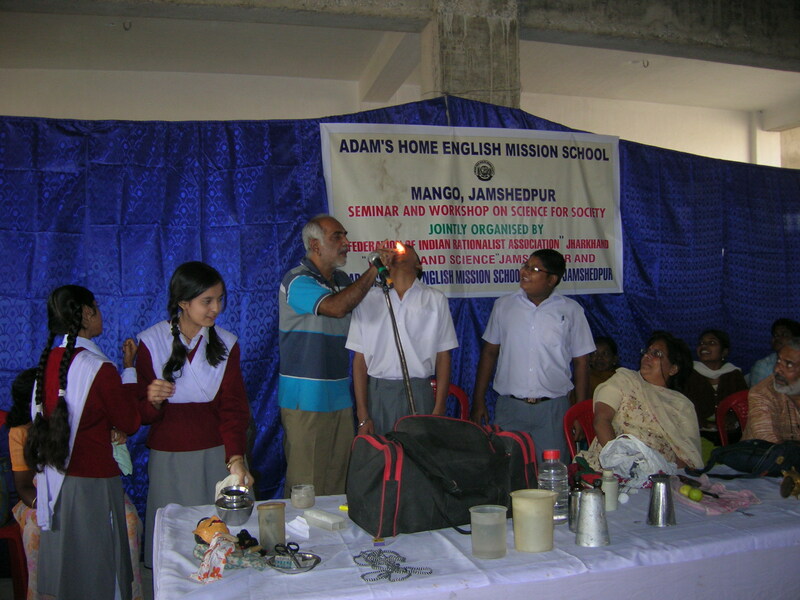 He spoke to stduents of Adams Home Mission school on the 22nd and gave two talks at Awadh Dental College and Hospital on the 23rd. The topics were-modus operandi of quacks and on the techniques to eradicate superstition. Enjoy these images! Firewalkers: The Bokaro Deputy Commissioner took part in the demonstration by walking on hot coals. 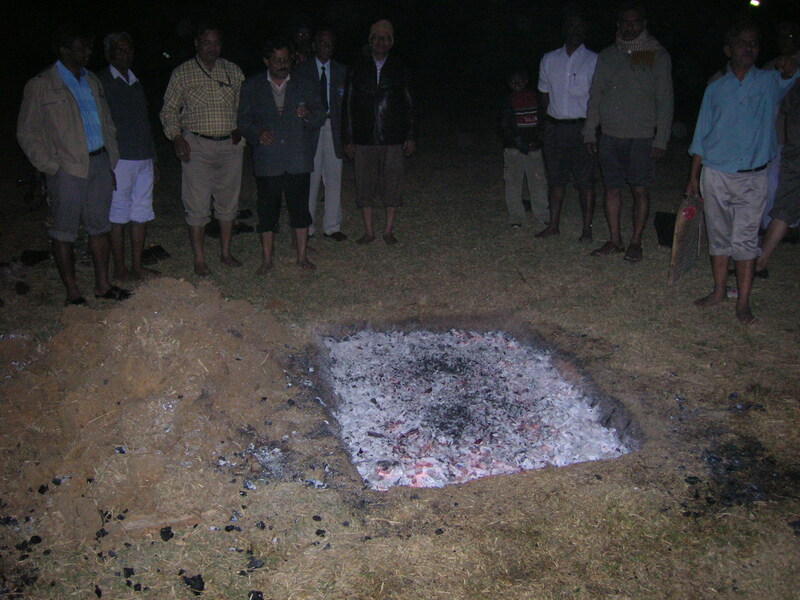 Newspaper reports of this incident brought more publicity to the firewalk and the rationalists efforts. 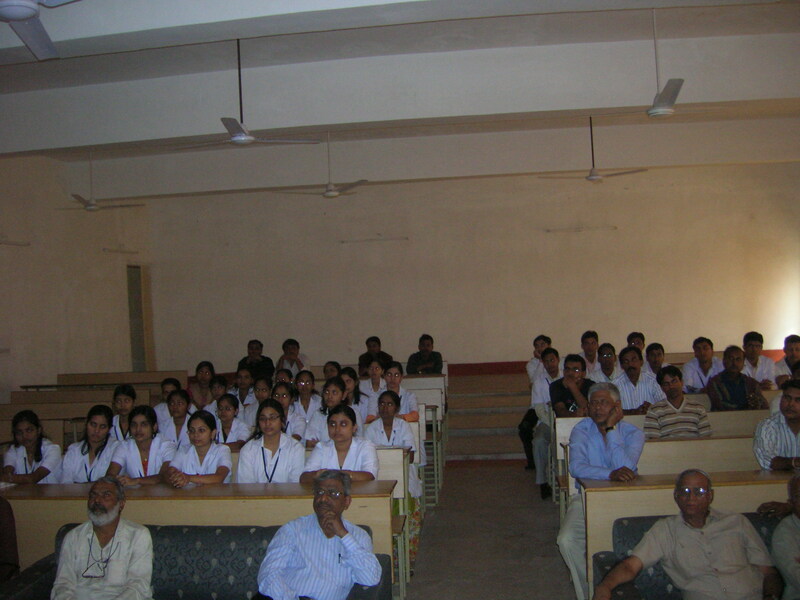 Audience at the Awadh Dental College, Tatanagar. Editor’s Note: Hyderabad, November 20, 2008. This week Narendra Nayak is in Tatanagar. As you may know, Sai Baba’s ashram in Hyderabad is a major attraction for irrational elements. Narendra’s reports on the delusions of Sai Baba’s followers by providing an excerpt of a letter from a Sai devotee. The images kindly made available to us by this devotee will show you the extent of this charlatan’s grip over the people. The pope’s followers are the only parallel to such mindless behavior. Narendra’s report follows. 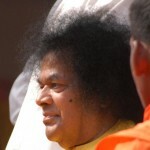 This is an unedited email from one of Sai Baba’s devotees, Preetham Sai. The text color is preserved from the original email. Here it is. I know you wont be feeling ‘GOOD’ to read this report and check out the pics… :-)) But then you have no other option dear…!! Words can’t explain the kind of bliss that thousands of devotees witnessed during the last day of Sahasra Poorna Chandra Darshana Shanthi Mahotsavam. Apart from the many thousands, there were many Swamijis belonging to various temples,spiritual organisations and Institutions. The atmosphere was totally Divine and why not – it was the day to thank the DIVINE for coming to His world, and witnessing 1000 full moons in this BODY. People started coming in as early as 5am into the stadium. The security staff were all alert and everyone wanted this DREAM day to be a very grand one in typical Swami’s style. All the VVIPS one could think of were present in Puttaparthi apart from many other dignitaries. And while we all were waiting for Swami, Prof.Anil Kumar and Nagaphani Sharma rendered some beautiful poems praising our beloved Swami’s compassion and love. At 9:45 am the most auspicious time, a profoundly memorable moment in our lives, that moment which is undoubtedly a result of years and years of sadhana, that moment of glory, which made every one jump in joy and that moment of joy which took us to Samadhi state came when the Lord of the Lords clad in bright golden yellow robe, seated in the golden coloured Mobile Throne appeared. Sathya Sai Hill View stadium amidst veda chantings with 3 huge elephants leading the procession followed by students chanting vedas. 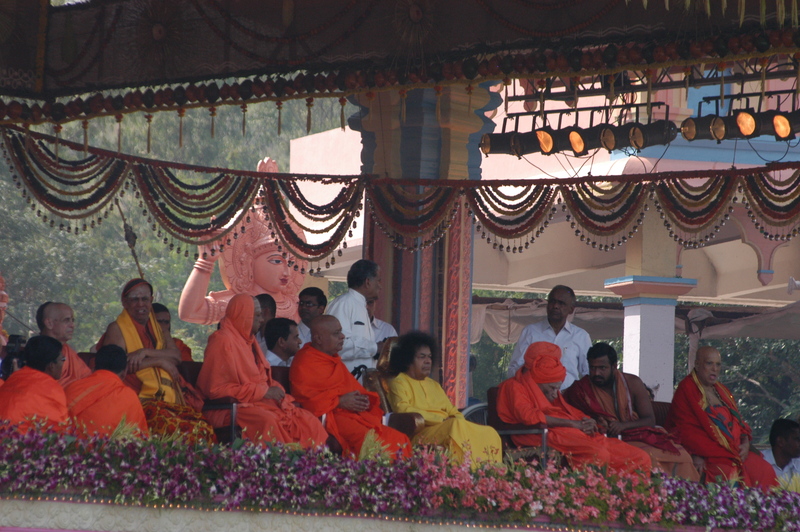 The priests and all the Swamiji’s on the dais watched the Greatest Avatar the man kind has every witnessed. Thousands in the stadium were wiping their eyes, to take away the tears of joy and have a good view of the MATCHLESS Lord whom we very rarely see in His Golden Chariot. Swami’s chariot which had small tyres was pulled by Sevadals, (they might have done lot of meritorious deeds in their past lives to be chosen for this once in a life time chance), and the chariot took its time and it was just beautiful to watch Swami in His golden chariot seated all alone, blessing all the devotees seated on either side, watching all the arrangements in the stadium and a sweet smile in appreciation. The Chariot slowly came closer to the dias, all the primary school kids seated right across the dais were in full swing with their characteristic full throated veda chanting. 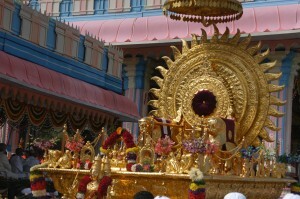 Swami sweetly looked at them appreciating their devotion and blessed them from the Golden Chariot. 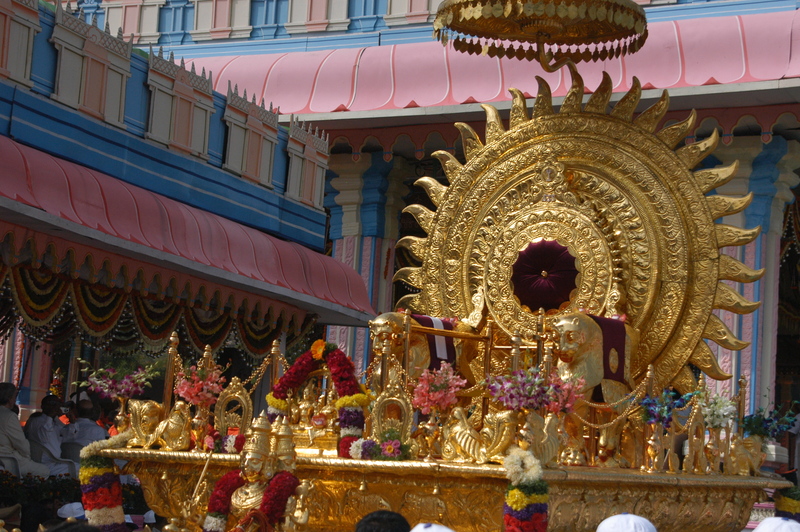 As the Golden Chariot came closer to the dais, He was slowly wheeled on to the dais and all the Spiritual heads looked at Him, some of them were here for the first time and we could see the bliss on their faces and a first hand experience of what our Swami is and what we devotees mean to Swami and the love He has for us. The Chariot stopped in front of the dais and Swami transferred on to the dais. He then proceeded to see the vedic activities taking place by the priests and Swami visited each and every Yagna Kunda and blessed the rituals while witnessing the poornahuthi thus ending the Most memorable Event which the Man kind has ever witnessed so far.Swami then came forward and all the Swamiji’s were seated on either side of Swami. It was a treat to watch this particular scene where the Avatar of this Kali age with Swamijis from distinguished Spiritual organisations (Muths) in India on either side. Sri ShivaKumara Swami from Sri Siddaganga Muth Spoke in kannada thanking Swami for this opportunity and asked the humanity to uphold the Indian culture and Dharma. 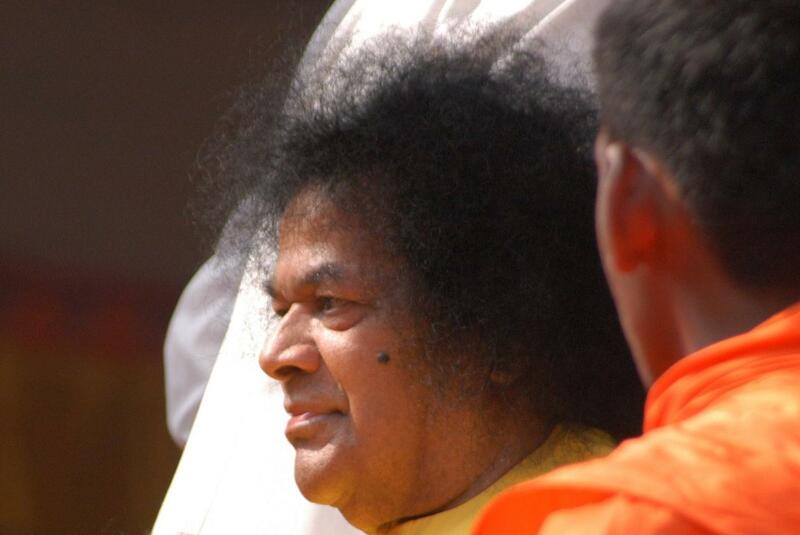 The Swamiji who is a centurion was seated next to our beloved Swami and Swami had a sweet smile when He exchanged words with Him. Prasadam was distributed to all the approximate150, 000 devotees (the chosen souls) and we all left for our homes with our familes hoping to come back again at 5pm for a cultural programme by Ms.Mahalakshmi Iyer and Troupe and hopefully a divine discourse from the 1000 full moon Swami… while others headed to the Bangalore International Airport to get back to their countries after their 3 or 4 day after having witnessed one of the most important days in the history of the universe. Narendra’s first stop was in Chennai. Here is a brief report on his activities there, in his own words. 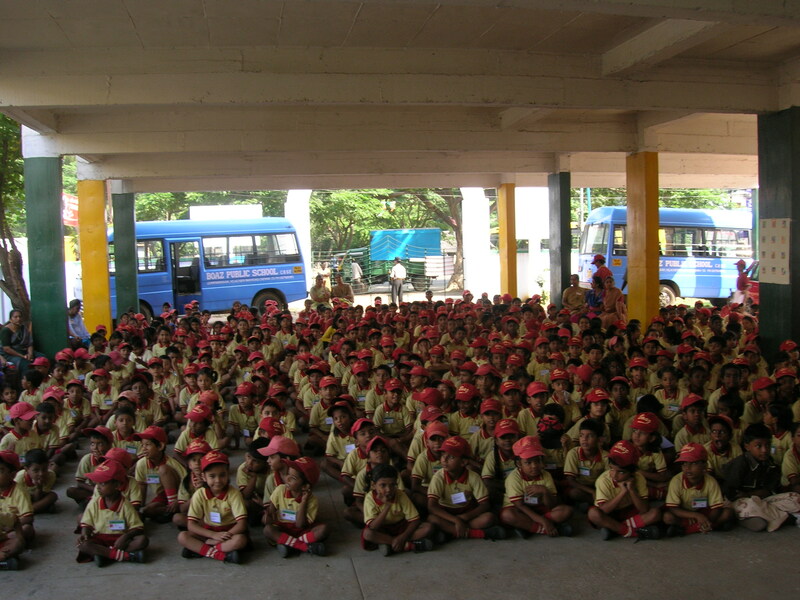 A program was conducted for the students of the Boaz School, Tambaram near Chennai on the 17th Nov. 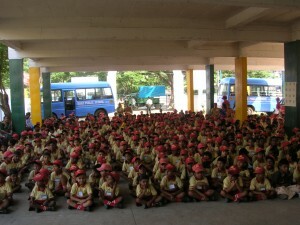 The program was started with items for the whole student community starting from students of the 1st std. As the program went on the lower classes were sent away and the interactions conducted with the students of the higher classes finally ending at 1pm after three hours. There were innumerable questions followed by videos of some of the so called godman’s so called miracles and discussions. The training program at Tatanagar commenced on the 20th November at the Science center premises. There are about 25 trainees who have enlisted for the 5 day training program. There are mainly tribals from rural areas of Jharkhand who have enrolled for the training. On comparing notes about the problems faced by them it was mainly the lack of medical facilities that has been driving the tribals to the quacks like Ojhas who have been exploiting them in the name of spirit possession and consequent exorcism rituals at a heavy cost in terms of loss of money, health, working days and many such ill consequences. Many of them also mentioned about various tricks done by these people to show that they have supernatural powers and hence can heal the sick! Some of them complained about qualified medical doctors with degrees in scientific medicine doubling as exorcists and demanding double fees-one for the proper medical treatment and the other for the spiritual rituals. Some of them have come from remote areas where one has to walk for miles. Their villages do not have modern facilities, electricity or any medical facilities. 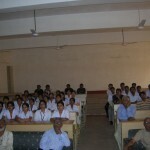 The inaugural session was presided over by Dr.S.M.Aurora who retired as a scientist from N.M.L. Dr.D.Hansda who retired as the Principal L.B.S.College, Tatanagar and who himself is a Santhal, inaugurated the training program narrated his battles against superstitions and how he had challenged many instances of ghost appearances and spirit possessions. The trainees narrated their experiences and their expectations from the program. The trainees who are mostly are expected to conduct such programs in their villages, create scientific temper, end the exploitation by quacks and unscrupulous priests. Narendra Nayak is a retired professor of biochemistry and the president of the Federation of Indian Rationalist Associations, an umbrella organization that includes over 65 free-thought organizations in India.